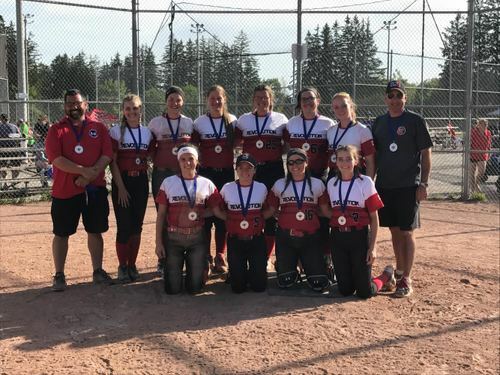 Our Revolution 1 (U19 Tier 1) team completed a successful weekend at the Barrie Bash with a silver medal in the event. The team played to a 4-1-0 record heading into the final game on Sunday afternoon vs the Vaughan Vikings. The game saw several lead changes in the early innings, before Vaughan powered ahead in the 5th and then held the lead until the final out was recorded in the 7th. Revolution saw several great performances this weekend, including the defensive play of Kerys Bartnik, the continued strong bat of Jillian Botting, Sydney Redick and Anna McGinnis. The team also tightened up the defensive play this weekend which helped the team secure pool wins vs Guelph, Milton, Vaughan 01, and Whitby. The group is off this coming weekend… before they host a 1-day exam play day the weekend of the 23rd.